See Parts & Service page for some long awaited new items and some really cool 70s early 80s stuff from the stash upstairs. Dial up users be patient, the photos are worth it! Old Dude Vintage has been in business since 1981. We are the source for obsolete NOS Harley Davidson hardware and quality reproductions, and we stock over nineteen thousand part numbers. While our specialty is hardware, we also have a number of larger parts. Clete has over forty years experience in the business and has been factory certified since 1965. The Old Dude's policy is, "The deal is not final until the customer is satisfied." 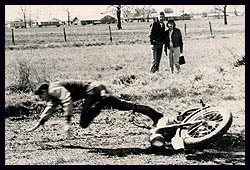 We are members of the AMCA (Antique Motorcycle Club of America), AMA (American Motorcyclist Association), and The Dixie Chapter of the AMCA. Old Dude does not have a catalog, we work with Harley Davidson OEM part numbers. We can find your part using either the early or late (preferred) numbering system. In the unlikely event we do not stock what you are looking for, we can usually direct you to someone who does. 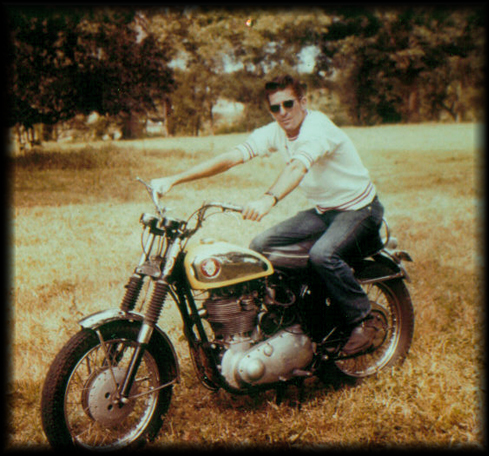 We all had humble beginings...Here's the Old Dude circa 1958 before being blessed by the Harley Gods. What that he's riding? A 1957 BSA Goldstar! 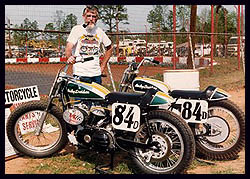 Here is Clete at Dixie Speedway in Woodstock, GA with his former factory 1968 750 KR flat tracker previously owned by Bart Markel. Also shown is his 1973 350 Sprint. 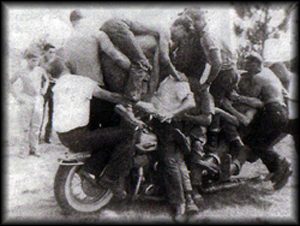 The reason the Buddy Seat was invented!